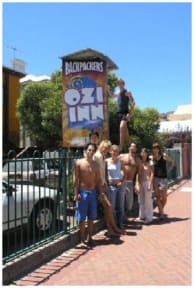 Ozi Inn is situated in the heart of the night life scene of Northbridge and is only a 10 minute walk to the city centre. This small friendly hostel is a Drug Free zone where you get to meet many travellers from all over the world. A great place to be for long and short term travellers. Many say it's their 'home away from home'. Great for holiday makers, couples and to meet up more people in your travel life. Heaps of fun people and exciting environments with budgeted rate. Ozi Inn offers free party / dinner night to residents time to time, keeps everyone happy and rocking!!! However, its a fun hostel and not a hotel that you want to complain later. You spend less, expect less... yet we are fun and friendly!!! pretty close to city and walk distance to Bars and Pubs. Great place to have a good sleep after a crazy night. Tasty free bread in kitchen! Nice! This is a great place to stay long-term. All the people in this hostel are there for a while, so you have the chance to really connect with other people that you're living with. The showers, bathrooms and beds could use some updating/cleaning, but it's fine otherwise. Not a fancy place to stay, but home-y. Great location and the vibe and people were amazing! Kitchen and bedrooms were clean. Only improvement would be more showers, as there is one unisex bathroom upstairs shared by quite a few people. Nice hostel. Airport pickup is very convenient after a long flight (although the driver was 45 minutes late). Nice facilities and the bed was comfy. Room was pretty dirty though, lots of rubbish. I think they're cleaned twice a week, should really be more often. The wifi is good, it reaches the rooms (most hostels it's only in the reception) BUT it doesn't work with apple devices which is very annoying. Overall a good hostel, I'd stay there again. I stayed for a weekend and there was no atmosphere at all in the hostel. I found the guests that were there for a long stay to be unfriendly and the staff weren't much better. The room was fine although couldn't sit up in my bed as the top bunk was so low. A very basic hostel but it was cheap so you get what you pay for. Free pick up from the airport is good and rooms are big and spacious. Other than that its pretty dirty and not many bathrooms. Alright for a night. Fine to sleep in but no atmosphere and the kitchen was covered in ants.